Interspace Review 2019: Is Interspace a Good Hosting? Interspace is the right host for the casual blogger, a small business, or someone who needs a static informational website etc. It claims to be Israel’s leading website hosting provider. 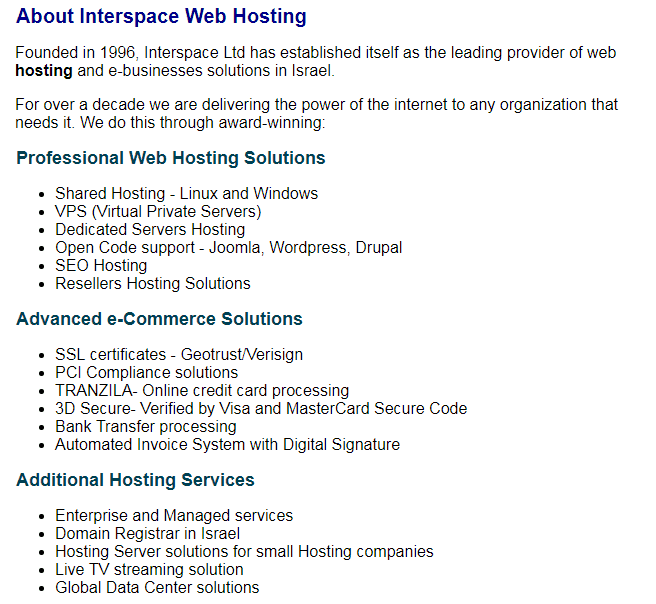 InterSpace was founded in 1996 and by providing high-quality website hosting services, it has established itself as the leading company in this sector in Israel. They not only offer professional website hosting solutions but also have separate solutions available for those wishing to create their online stores. They are partnered with leading international companies such as Microsoft, Paypal, HP, and Intel among others. InterSpace puts a lot of emphasis on its SEO services and uses Multiple Class C IP addresses to make your websites look like they are on different servers. This ensures that search engines like Google don’t categorize all your websites into one family just because they have the same owner. This is a great advantage if your website’s SEO is important to you. Packages for both Linux and Windows shared hosting are divided into three categories: Starter, Mini, and Regular. Unfortunately, I could not find details of their packages. The website only says that they offer limited disk storage and a certain amount of email accounts with each package. They do offer all the usual website hosting features but they haven’t displayed to what extent they offer these. All packages come with a thirty-day money back guarantee so you have enough time to check out the features and switch to some other host if it isn’t to your liking. InterSpace have an active presence on social media which I always find advantageous. They usually reply immediately on Facebook. They also have their own YouTube channel. You can get in touch with them through email or telephone, in case you don’t want to take the social media path. InterSpace’s own website does not give the best first impression but they do offer good services for the casual blogger and small business. Those with greater requirements might either want to get in touch with them to find out more details or look elsewhere. For me personally, their website leaves a very bad impression, especially with outdated information such as Google’s 2012 algorithm still posted on their website. Wondering how Interspace stacks up against other Web Hosting companies? Enter any other Web Hosting company and we will give you a side-by-side comparison.